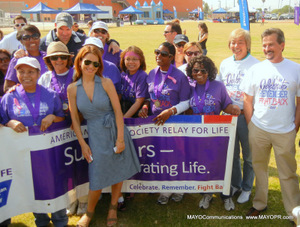 ABC TV’s “General Hospital” Lisa LoCicero (center) with cancer survivors, Greg Yau, Roland Ludlow (far right) Sun Born Natural Products Co.
Greg Yau, Actress Catlina Rodriguez, Roland Ludlow at Relay for Life event. Cancer surivors dressed in purple T-shirts, Hollywood celebs, and Councilman Tom Labonge joined the non stop walking around the clock to battle cancer. The American Cancer Society’s two day event in Hollywood ended Sunday. Team members, armed with tents and sleeping bags, and gather at HelenBernsteinHigh School football field over the weekend for the overnight campout against cancer. Celebrities lines up for photo shoots with cancer survivors and several hung medals of honor over the knecks of long time cancer survivors. After soliciting pledges from friends, family, neighbors and colleagues, everyone took turns walking or running around the track and shared their experiences of courage, hope, and inspiration with each other. Cancer survivors walk around the track in Hollywood at Relay for Life event. “The American Cancer Society’s Relay For Lifeis a life-changing, family-oriented community event that celebrates the lives of those who have battled cancer, remembers loved ones lost, and empowers individuals and communities to fight back against a disease that affects so many,” said Eric Beikmann, American Cancer Society, Los Angeles office. Sun Born Natural Products Company armed with scores of Herbal Chi Balm passed out the samples to celebs, cancer survivors and participants at the crowded event. Filed under Uncategorized Tagged with American Cancer Society, General Hospital stars, Herbal Chi Balm, MAYO Communications, Relay for Life, Sun Born Natural Products Co.